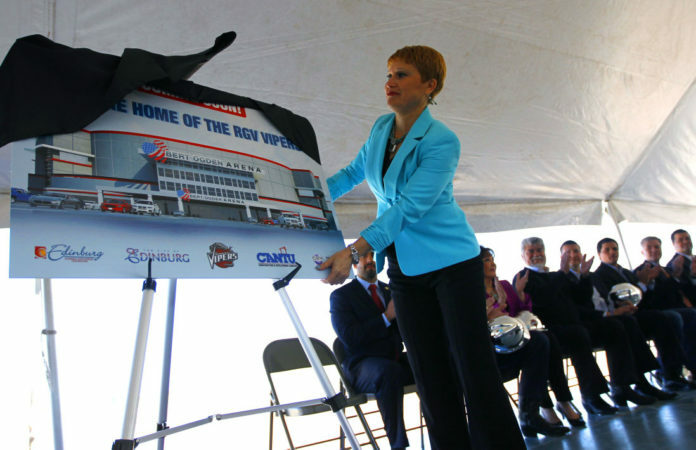 Irma Garza lifts a veil to show an artist rendering of the Bert Ogden Arena in Edinburg. EDINBURG — The former spokeswoman here found a new city to represent. Irma Garza, who formerly served as Edinburg’s public information director, is now serving as the public affairs director for the city of Harlingen. Garza announced her employment Tuesday in an email detailing a capital improvement project for the city. The former KGBT-TV anchor was abruptly terminated from Edinburg in late February amid a shake-up in the city. Garza represented Edinburg for more than a decade. She declined to comment Wednesday on her new position.